With spring in the air, now is the time to start planning your first outdoor barbecue of the season. Why not make it family friendly, now that the kids can play outside? Here we’ll share our tips for throwing the perfect affair for the whole family. Yes, your focus is on entertaining the adults since this isn’t a party of the cone hat variety, but if kids are welcome, you have to plan to keep them occupied. 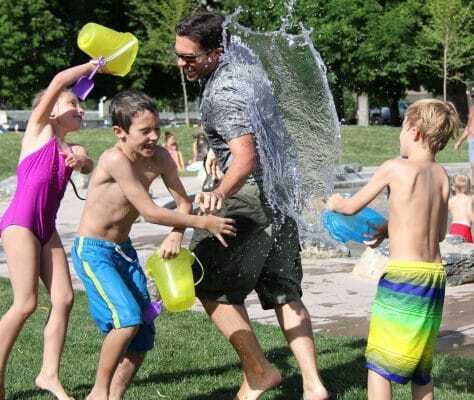 Your friends will appreciate a little built-in fun for their kids, and chances are, they won’t be expecting it, so you’ll be forever in their graces. You don’t have to break the budget with a bouncy castle or hired balloon maker, but you should have on hand something for the kids to do such as provide a bucket of balls, jump ropes, chalk (super soakers if you’re brave). Maybe hire a few local teenagers to come organize a scavenger hunt a la Pinterest, Jenga, or Tic-tac-toe. Another option is something as simple as kickball, flashlight tag, and hide-n-seek. The parents will be in heaven! With the potential for picky-eaters, now isn’t the time to go gourmet, but that doesn’t mean you can’t offer classics with a twist. Hamburgers and hot dogs are always a sure hit with the kids and maybe you can grill marinated pork tenderloins in various sauces or cook up fancy, spicy sausages? How about grilled steak and chicken kabobs with a delicious sherry, soy and ginger marinade? Add to that an array of colorful grilled vegetables, watermelon, and sweet corn and it’s a wrap. As for dessert, you can’t go wrong with fresh fruit, grilled pineapple slices sprinkled with cinnamon, a seasonal pie, and kid-approved desserts—such as ice cream cones and cookies (peanut-free of course). Don’t forget to stock up on popsicles. Keep a cooler full of water bottles and juice boxes on ice conveniently located near where the kids will be playing. When was the last time you used your grill? The fall? 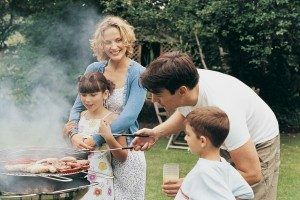 First check that you have enough gas (and consider purchasing a second tank and storing it this season so you are never caught mid-party with a grill that won’t start). Be sure your grill is in good working order and is clean and ready to go. Consider having an expert from an appliance repair company you can trust, such as Don Bacon Appliance Service, come out and take a look. Decide on a kid-appropriate playlist ahead of time and get the outdoor speakers ready, or use your portable wireless speakers. When the day arrives, you can relax, let the conversation flow, and enjoy your guests! As you know, it’s inevitable when you get a group of children together that someone falls down and gets hurt. Be prepared. Replenish your First Aid kit—primarily the stash of bandaids (for boys and girls). Also, gather your beach towels in case someone gets wet. Most importantly, remember: nothing helps a boo-boo like a popsicle!